I was shopping in my local Target, getting ready for Easter. I came across some cake stands and I thought it would be nice to have one for a special cake I was making for the holiday. Normally, I’m “no fuss” and I would simply slice and serve a cake right from the pan I baked it in. Call me barbaric! And cheap. Just as I was about to make a decision to spend $15 to $25 for a cake stand, that I’d maybe use twice a year, I saw this “fancy” cake stand-punch bowl combo. I read the back of the box and saw that by simply inverting the cover to the cake stand that it became a punch bowl. Not quite the Transformers, but still clever. Then I thought to myself that I could use the same principle with a simple plate and matching bowl to create my own DIY cake stand. 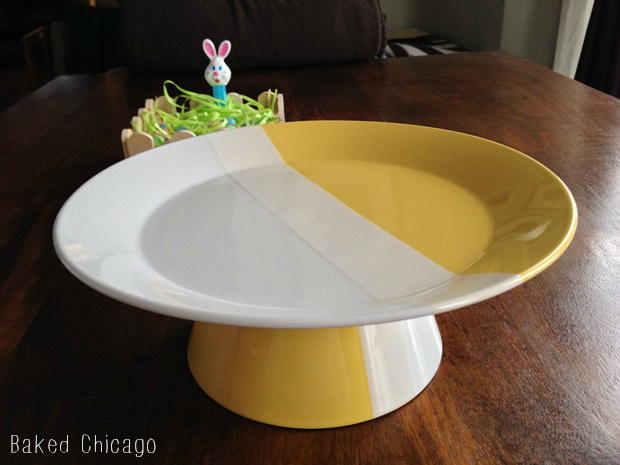 The size of the plate and depth of the bowl were critical, so I first found a large plate that had a very modern, spring-like design using yellow and white color blocking. And the matching bowl was very deep. The best part: together they were less than $7. So I easily saved at least $10. To make this cake stand, all you need is some hot glue or a quick-drying epoxy. Because the plate and bowl are ceramic, be sure to use glue appropriate for that material and surface. Turn the bowl upside down and apply the gluing agent. Then carefully center the bottom of the plate to the bottom of the bowl. Press down to secure, then let dry. 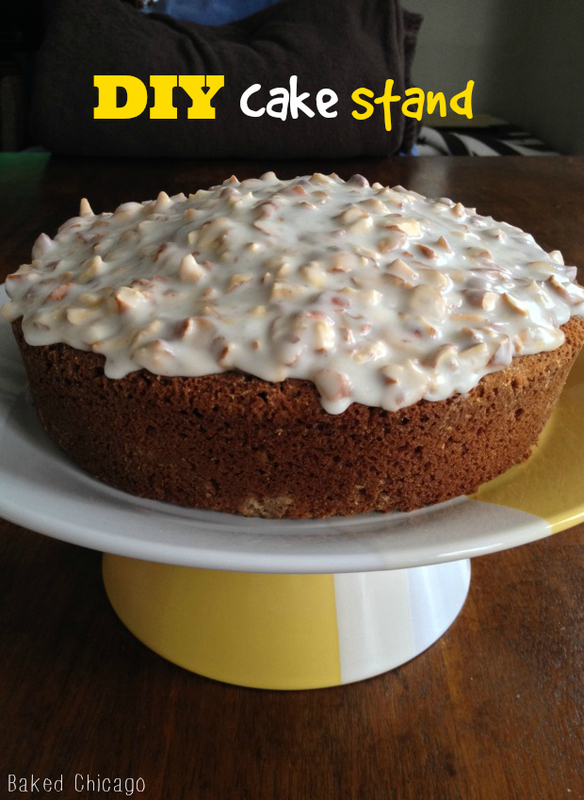 And you have a deliciously simple DIY cake stand to showcase your culinary creations.